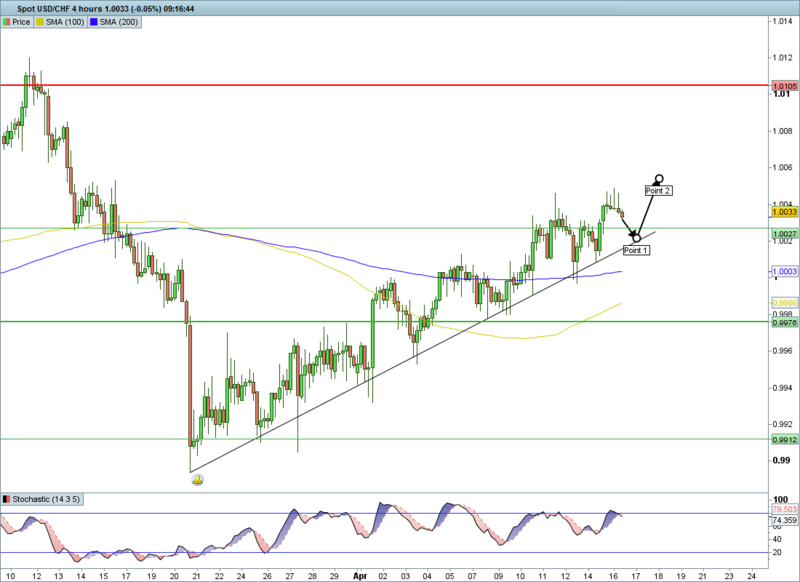 Looking for USD/CHF retracement before a continuation up. Today we will be looking at the USD/CHF, and as we can see from the weekly chart, we have been steadily climbing from the low of 0.9188 in week 7 2018. And price has been stuck in a large triangle, with a note of the upper resistance above the triangle of 1.0278 area which has been the long term (from 2014) highs. In recent weeks we have come off the upper trendline around the 1.0105 area, and even though we did not make it to the lower trendline and weekly moving averages, we have turned around again and are on the 4th week of gains. 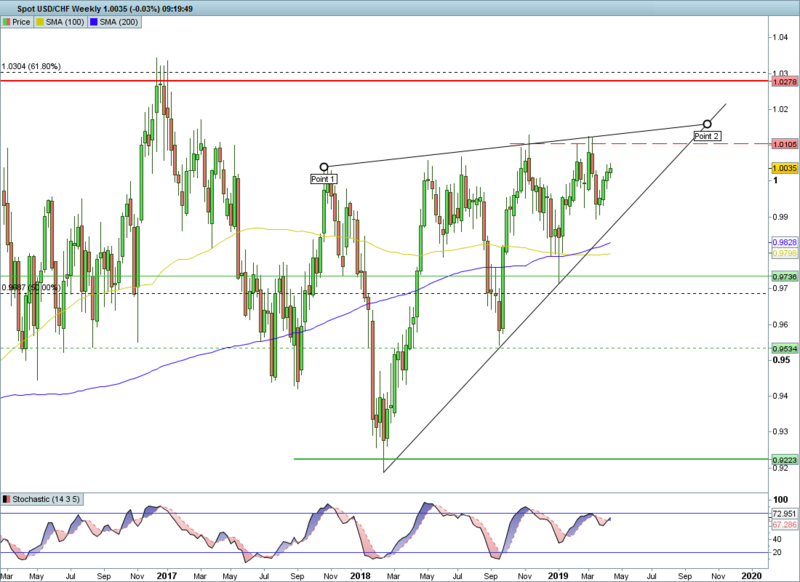 We are looking set in the long term to retest the 1.0105 area. We move to the daily chart to bring into focus the fall off the high of 1.0124 and the recent move back up, we have retraced all the way back to the 61.8% fib and this level of 1.0036 has become important resistance. 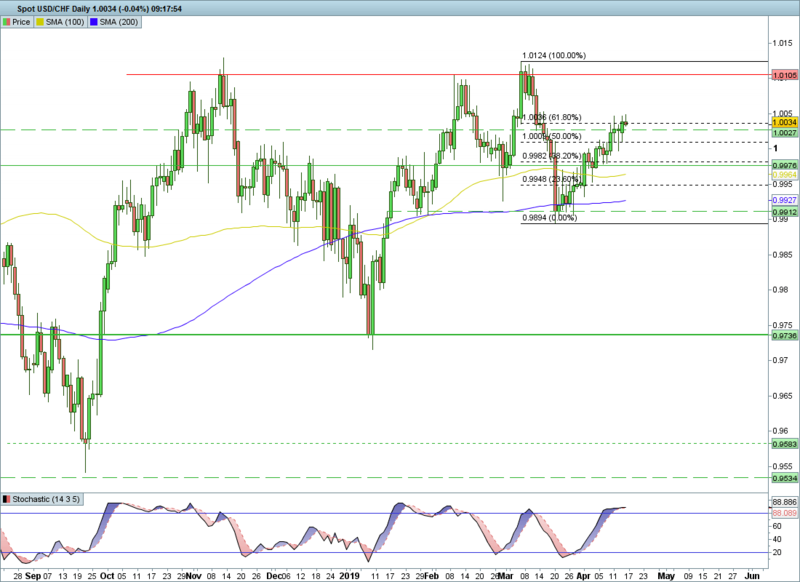 As a hold above here could indicate the retest of the 1.0105 area and the highs of 1.0124. The 4 hour chart shows a perfect move up along the lower trendline reaching the 1.0036 area, with the first test rejecting and move straight off that level. But as we reach the area again and have some indecision candles, and we will look for a sustained break above the fib and resistance. All opinions, news, analysis, prices or other information contained in this communication (the "Communication") are provided as general market commentary and do not constitute investment advice, nor a solicitation or recommendation for you to buy or sell any over-the-counter product or other financial instrument. You are prohibited from disseminating, distributing, transmitting or forwarding this Communication to any other person or entity without our express written consent. Trading foreign exchange, foreign exchange options, foreign exchange forwards, contracts for difference, bullion and other over-the-counter products carries a high level of risk and may not be suitable for everyone. Any information we give in this Communication is focused exclusively on spot FX only and we provide no advice, analysis, recommendation or other views on foreign exchange derivatives, which are regulated financial products. Further, this communication has been prepared without regard to any specific investment objectives or financial position (including deposit size, leverage, risk appetite and risk exposure) of any specific person. Any reference to historical price movements is informational and based on our analysis. We do not represent or warrant that any such movements are likely to occur in the future, as past performance is not necessarily indicative of future results. The Communication, although based upon data obtained from sources believed by us to be reliable, may be inaccurate or incomplete, may not have been verified and may be changed without notice to you. You understand that we do not distribute the communication with the intent of impacting your investment decisions, therefore, you release us from any liability for any losses, including without limitation, any loss of profit you may incur as a result of reliance on such information or entering into any transaction. By receiving this material, you confirm and agree that you have read, received and understood these conditions. All comments, charts and analysis in this Communication are purely provided to demonstrate our own personal thoughts and views of the market and should in no way be treated as recommendations or advice. Please do not trade based solely on any information provided within this Communication; always do your own analysis. The risk of trading Foreign Exchange (Forex / FX) is substantial. The high degree of leverage associated with FX can work against you. Leverage can result in substantial losses, you should carefully consider whether FX trading is suitable for you in light of your financial situation. If you are unsure you should seek professional advice. We will not accept any liability for loss or damage as a result of reliance on the information contained within this Communication including data, quotes, charts and buy/sell signals. We would like to remind you that the data contained in this Communication is not necessarily real-time nor accurate. FX prices are not provided by exchanges but rather by market makers, and so prices may not be accurate and may differ from the actual market price, meaning prices are indicative and not appropriate for trading purposes. Therefore, we cannot bear any responsibility for any trading losses you might incur as a result of using this data. Copyright Simon Cotterill Trading Ltd. All rights reserved. This publication is protected by copyright and may not be reproduced in whole or in part without permission.